Christmas is over and the New Year is upon us. This year I witnessed a number of close friends watch their own special angel transition, the sorrow of which has been indescribable. I put up our Christmas tree early in November to honour one such angel on the day he passed. Today, I have decided I will take down our Christmas tree. I think this is the earliest I’ve ever done so, but it just feels like it is time. It is time to embrace that special kind of hope. Pretty much everyone looks at the New Year as a time to reflect, and then a time to look forward. A time to hope for better things to come. But when it comes to a parent of a child with a life-limiting illness, our hope is magnified. Ten fold. A hundred fold. Who am I kidding, we hope like there is no tomorrow! Ah, wait. Therein lies the key to exactly why we hope as we do…because for our angel, we never know if there will be a tomorrow. Now, this isn’t a negative way to think. Once this gut-wrenching fact is accepted, it can (and should, and in time will) evolve into a new way of looking at life. And oh how we do! In fact, some of us are thought of as eccentric. Some as too outspoken. Some as a bit mad in the head. But at the end of the day, what it is about us…what makes us HOPE like we do…is our understanding of the fragility of life. The fleeting nature of life. With that comes a respect for it that brings us to a level of passion for life that many others cannot fully grasp. We live life to the fullest. With hope. With passion. We know life is made of moments, not years. Bring on 2016! We carry hope for our angels that this year will bring stable health. We have hope for the siblings that they will continue to thrive as individuals in their own amazing way. And, very importantly, we hope for ourselves. Yes, we must remember ourselves on this journey too, and remember to live our lives to the fullest, with passion and hope, nurturing the person we are outside of the role as the parent to a special child. So, here’s to life lived to the fullest…with passion…with hope! Christmas. It has been my favourite holiday since I was a little girl. And, it still is! But now that I am a mother of a child with a life-limiting illness, Christmas has taken on an entirely new meaning. It has a different role in my life. It is a joyous celebration, to be sure. But it is also a reminder of how different my family’s life is. Some of us, like myself, have been shopping in the same toy section for our precious angel their entire life. Namely, the infant and/or toddler toy section. For me, this makes the eleventh year. Eleven…and still in the same section. Let that soak in, please, because it IS hard. Christmas (and birthdays), while lovely holidays, tend to slap us parents upside the head with the stark reminder that our special child has drastic challenges and needs. It is hard, and it can hurt. We can hurt. Behind the smiles and laughter, we can hurt. Because with Christmas comes the New Year, it is a milestone for those of us with a child who has a life-limiting condition. Being blessed to share another Christmas, another New Year, is FANTASTIC! And so, what do we do???? We go BIG! The tree is up early, the decorations are all over the house, and some of us even have an extra tree in our special angel’s room because don’t you know, most of our kiddos absolutely adore the bright multi-coloured lights?! So bring on the decorations…oh wait, we already did…in November! It’s that time of year for sickness. Our healthy kids are sick half the time, so can you imagine what it does to our fragile angels? Right. As such, we often avoid crowds, maybe even avoid neighbours if we know their children are ill, because the last thing we can afford to do is have a cold come into our home. We need our friends and families to understand why we are this way, please! A cold in our angel turns into bronchitis or worse yet, very quickly into pneumonia. Pneumonia means the hospital…and it can mean far, far worse for our child in a very short amount of time. So, please understand this: We are literally trying to save our child’s life. Medical supplies. No, this isn’t going where you think. Actually, they can come in quite handy! Roasting a turkey for Christmas? Just ask any of us parents for a 60ml feeding syringe (we’ll give you a sterile one, we promise) and there is the perfect baster in case you’ve lost yours since last Christmas! Don’t have the pastry chef selection of frosting tubes for decorating the gingerbread men? We’ve got you covered! Again! A 10ml syringe filled with frosting works perfectly for the finer artistry skills required for the best gingerbread men around! Siblings…we cannot forget those amazing, compassionate, unintentionally self-sacrificing siblings of our children with a life-limiting illness. Christmas is for them, too. And maybe, it is for them ESPECIALLY. All year long those siblings have given up their time, lost our attention, and been understanding in a way that no child should have to be, but is so beautifully. So, to our dear friends and family, if you see us go overboard on Christmas morning with Santa having brought our “other” child loads more than the average kid on the block…relax. Let us. It will not, I repeat will not, ruin them. And understand this as well, please, as you go back to point number one above: It is our only chance to buy age appropriate toys. What a treat it is, albeit a very bittersweet one. One last thing to note. Never far from our minds are the families who are celebrating Christmas without their special angel because during the past year (or even before) their angel transitioned and is now watching over them. We ache for them and we remember them. And as we celebrate another Christmas with our angel, thankfully, we hold close the knowledge that next year we could be celebrating Christmas without our angel, too. Then we hold ours a little closer, a little tighter, and we give thanks like you cannot even fathom. Life is so precious, so fleeting, and should be cherished every single day. The gift of Christmas. To all my fellow special families from mine, I wish you a very Happy, love-filled Christmas and a New Year filled with joy! 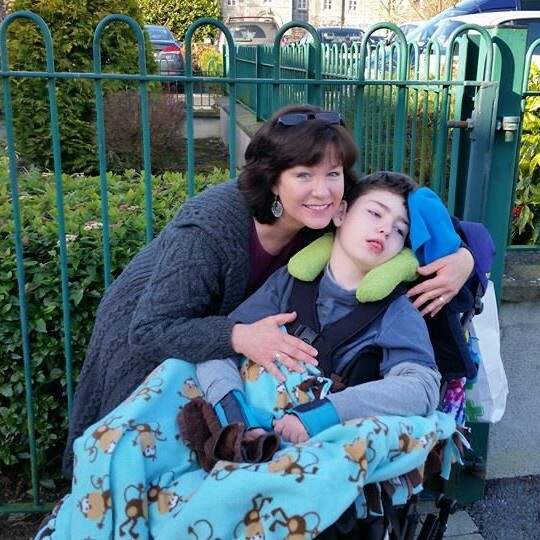 I don’t usually use the word “normal” when it comes to my son with a life-limiting illness. I prefer “typical”, as do many other parents on this journey. But, once in awhile, we have to readjust even our idea of “the norm” for our child. Things change. And on this path, things often change in ways that bring the harsh reminder our precious angel is transitioning…moving closer to that time he or she will be watching over us, rather than us watching over him or her. With this change of the norm comes one of the hardest tasks for us parents: Accepting the new norm. The past few months I have had to once again readjust my idea of what my son’s “norm” is. The last time such a big change in his health occurred was about 3 years ago when he began having more intense seizures that involved not only longer length of seizures, but also stopping breathing during them. With that came a permanent change in his brain wave patterns and being in nearly constant “status” (ESES: electrical status epilepticus of sleep…except his is also while he is awake, which is rare). With that change of his norm, he lost much of his already limited abilities physically and grew much more tired. It was a heartbreaking change for me to see happen. Fast forward to the past few months. The new norm is an intolerance of feeds, a slowing of his intestinal functions, apparent decrease in circulation and/or respiratory function as he frequently is cyanotic, and developing new types of seizures. He has LGS (Lennox-Gastaut syndrome) which is a type of epilepsy with multiple different types of seizures, so this shouldn’t come as too much of a surprise. But it does. ANY change in the norm of our special angel with a life-limiting illness requires us, the parent who is living every minute of our life watching our child’s life slowly decline, to come to yet another level of acceptance: The new norm. The awful, unfair, infuriating, AGONIZING, new norm. I have found on this journey that other parents who walk this same path are truly the only ones that understand the constant feeling of concern and sadness, be it hidden or on the surface, as we vigilantly watch and wait. As we try to accept the new norm for our child. As we try to remain strong and steadfast. So, we hold each other up (and if we don’t, we should) because the new norm is leading to that transition, whether we are ready or not. We must have that support network surrounding us, and we are beyond thankful for those that are there for us as we are thrust into accepting our child’s new norm.